Rigid Industries D-Series D2 LED Lights are one of the most popular and most versatile LED Lights on the market today for good reason. Rigid Industries D-Series D2 LED Lights produce extremely high output with minimal battery drain. Their compact size and shape don�t sacrifice light output and allow the D-Series LED Lights to fit almost anywhere and also be used for virtually any lighting application. 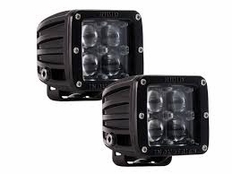 Rigid Industries D-Series D2 LED Lights feature patented hybrid optics that the competition simply doesn�t have. They make for the most powerful and efficient optics system around. The lenses are virtually indestructible and are scratch resistant. They combine technology of not only the LEDs, but also the lens and reflector for maximum performance. Over sized heat sinks keep temperature down and your lights operating perfectly even over long periods of time. Your Rigid Industries D-Series D2 LED Lights will come ready to go right out of the box. A switch, mounting brackets and hardware, as well as a plug and play harness are all included! Rigid developed the 5 degree HyperSpot light pattern for long distance applications. The narrow concentrated light beam pattern is a powerful spot light that utilizes a patent pendeng aperture system that blacks unused light for a cleaner more powerful light beam. The Rigid Industries HyperSpot pattern has the highest intensity per watt / square inch and also the best light distance.